An American doctor has come to the rescue of a Sattahip toddler suffering from “elephant man” syndrome after Thai hospitals wrote off his case and advised his impoverished parents to prepare for the baby’s death. Dr. Howard Resnick, 73, came forward Dec. 30 to place 31-month-old Nopakorn Oumprasert in Bangkok Hospital Pattaya and cover all treatment costs for parents Amporn and Pramod Oumprasert. 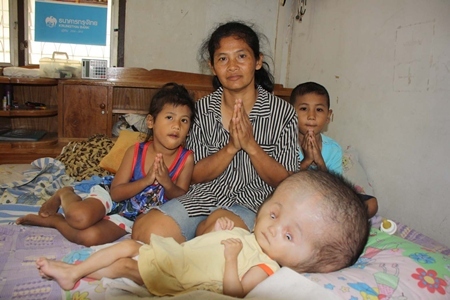 Little “Nong Kaan” has suffered from hydrocephalus since birth and has been lying in bed waiting for help in a small rented room on Soi Thepburapha. The Oumprasert family prays for a better future for young Nopakorn. Amporn said the toddler saw government doctors at Sattahip Km. 10 and Chonburi hospitals in 2010, but doctors said they were not able to do anything. They were told that the water on the brain syndrome was untreatable and that they need to prepare for their child’s death. More than a year later, however, Nopakorn is still breathing, cared for only by family in their apartment. With a cranial circumference of 92 cm, he suffers from crippling headaches and never leaves his room. Thanks to American Dr. Howard Resnick (left), young Nopakorn might actually have a future filled with much less pain and suffering. Pramod, a driver for the deputy mayor of Udomsak Sub-district, earns only 6,500 baht a month, leaving nothing extra to pay for doctors for Nopakorn. So they decided to appeal to the media for charity and hopes a hospital will admit their child for free. Resnick, a professor at Rajamangala University of Technology Krung Thep, said he didn’t understand Thai doctors’ decision to let the child die, as there is a treatment method – albeit a very expensive one – for hydrocephalus. Nopakorn’s parents didn’t have the funds to cover the surgical procedure, which implants internal cerebral shunts to continually drain excess cerebrospinal fluid. A May 2005 study in the medical journal Neurology said the cost of shunt systems is beyond the means of most in the developing world and most patients die without getting treatment. The procedure does have risks of infection or shunt failure and most hydrocephalus patients have to have later surgeries to maintain their shunts. 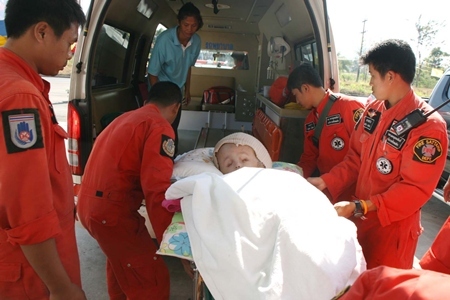 Shortly after publicizing their son’s condition, the Oumpraserts received 1,600 baht from Sattahip District Chief Chaichan Iamcharoen and his wife Nitaya, the head of the local Red Cross chapter. The Chonburi Independent Living Center on Dec. 28 agreed to give the child a government insurance card allowing them to receive an additional 500 baht per month. And the Udomsak government offered free ambulance service. Other than that, however, no Thai hospital, physician or government agency stepped up to help. The Oumpraserts thanked Resnick profusely for his generosity, as well as those who donated privately, including Chong Semsaan Temple, Singh Samut School and numerous individuals who sent money to Pramod’s bank account.